It is that time of year and we should be alert to threat of freezing weather and damage to trees. Last winter was one of the warmest on record, but there was still a sneak cold blast around December 25 that caused some problems in some areas. Wet winters tend to have lower frost threats, and even though wet is forecast for this winter, the forecast is erratic, as usual. That still leaves January which historically is when most of our damaging frosts occur. Fox Weather on the CA Avocado Commission is forecasting some cold weather coming up, so growers need to be prepared for the worst. Here are some links to frost information, preparing for frost and managing frost damage to trees. The forecast is for north winds, which often means cold, dry air and often with winds. Winds mean no inversion and no warm air that can be introduced at ground level to warm trees. If this occurs, running a wind machine can make the damage worse. 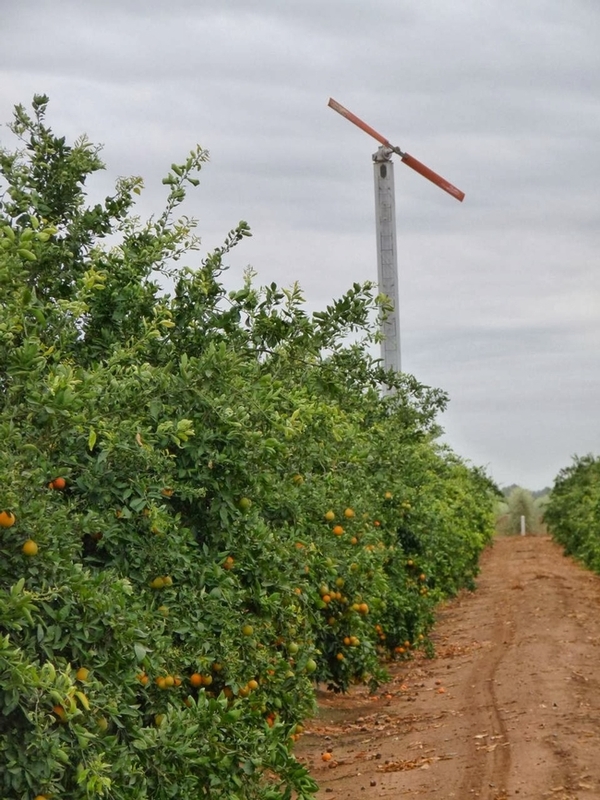 Wind machines and orchard heaters work on the principle of mixing that warmer air higher up – 20-100 or so feet higher than ground level which has colder air. When temperatures drop, the air is dry (wet-bulb temp below 28 deg F) and there is no inversion, running a wind machine can just stir up cold air and cause worse conditions (freeze-drying). It's better to not run the machine. The only thing left to do is to run the microsprinklers during the day so that the water can absorb the day's heat. Then turn the water off before sunset so that evaporative cooling from the running water isn't accentuated. Then when temperatures drop near 32 at night and the dewpoint is much below that, it's time to start the water again and let it run until sunrise (when risk is less). Running water works even if the water freezes. This is due to the release of heat when water goes from liquid to frozen state. This 1-2 degrees can mean the difference between frost damage and no damage. Also, ice on fruit and leaves can insulate the fruit. As the ice melts at the surface of the plant, it releases heat, protecting the plants. If there is not sufficient water to run the whole orchard, it's best to pick out the irrigation blocks that are the coldest or the ones you definitely want to save and run the water there continuously. Running the water and turning it off during the night to irrigate another block can lead to colder temperatures in both blocks.